Since the invention of the internal combustion engine, there have been many incredible innovations made in the auto industry. Manufacturers created new body styles and market segments, automatic transmissions and power steering were introduced, and safety features such as airbags made passengers much safer. Computers were even added into cars to optimize performance and provide GPS for navigation purposes. In short, vehicles got cheaper, lighter, stronger, safer, cleaner, faster, and more luxurious. But despite this, there is a strong case that the biggest innovations in the auto industry are yet to come. Today’s infographic comes to us from Evolve ETFs and it explains the many forces shaping the future of automotive innovation. Unlike past periods of innovation in the industry, the coming years will be particularly interesting because many of the changes will come from outside of the traditional workings of a car. Automation and the shared economy will change how the entire commuting model works. 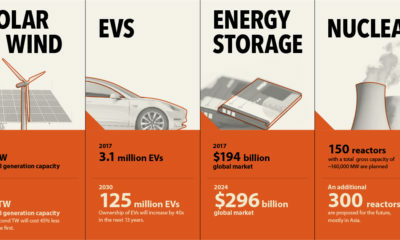 Meanwhile, an increased penetration of EVs will have an impact well beyond the engine, as charging infrastructure needs to be added, battery supply chains need to be created, and as legacy auto parts become obsolete. While these transitional changes take place, the auto market is expected to jump from $3.5 trillion (2015) to $6.7 trillion (2030) in total size – and a whopping 30% of the revenue will come from new services that don’t even exist today. The future of automotive innovation will hinge on four major technologies: automation, connectivity, electric power, and the shared economy. Perhaps the most obvious and fundamental change facing the auto sector is the rise of autonomous cars. Not only does this technology have implications on major manufacturers and suppliers to the auto sector, but giving the cars the ability to self-drive will have an impact that extends well beyond it, as well. The passenger economy, which will come from relieving people from the driver’s seat, is expected to be a $7 trillion industry alone by 2050. New cars are already taking advantage of increased connectivity today, and it will soon be the norm even in lower-end vehicles. This added networking unlocks new features such as infotainment, enhanced safety features, and diagnostics and analytical tools. In just seven years since its IPO, Tesla was able to leapfrog Ford in market valuation. Yet, this is still the very beginning of the EV revolution. Many countries have announced regulations to curb gas or diesel fueled vehicles, and EVs are expected to hit 41 million global sales by 2040. The shared economy is the result of technological factors, but also societal ones. However, when combined with automation, sharing presents a fundamental shift to how commuting and transportation will work in the future. With autonomous and shared cars, current commuter inconveniences such as traffic and parking will be reduced considerably – and it’ll make catching a ride to your destination far cheaper, as well. How will technologies such as automation and artificial intelligence end up impacting jobs and the workforce? Here are seven charts that tell the story. Over the last decade, the prospect of mass automation has seemingly shifted from a vague possibility to an inescapable reality. While it’s still incredibly difficult to estimate the ultimate impact of automation and AI on the economy, the picture is starting to become a bit clearer as projections begin to converge. Today’s infographic comes to us from Raconteur, and it highlights seven different charts that show us how automation is shaping the world – and in particular, the future outlook for manufacturing jobs. Half of manufacturing hours worked today are spent on manual jobs. In an analysis of North American and European manufacturing jobs, it was found that roughly 48% of hours primarily relied on the use of manual or physical labor. By the year 2030, it’s estimated that only 35% of time will be spent on such routine work. Automation’s impact will be felt by the mid-2020s. According to a recent report from PwC, the impact on OECD jobs will start to be felt in the mid-2020s. By 2025, for example, it’s projected that 10-15% of jobs in three sectors (manufacturing, transportation and storage, and wholesales and retail trade) will have high potential for automation. By 2035, the range of jobs with high automation potential will be closer to 35-50% for those sectors. Industrial robot prices are decreasing. Industrial robot sales are sky high, mainly the result of falling industry costs. This trend is expected to continue, with the cost of robots falling by 65% between 2015 and 2025. With the cost of labor generally rising, this makes it more difficult to keep low-skilled jobs. Technology simultaneously creates jobs, but how many? One bright spot is that automation and AI will also create jobs, likely in functions that are difficult for us to conceive of today. Historically, technology has created more jobs than it has destroyed. AI alone is expected to have an economic impact of $15.7 trillion by 2030. Unfortunately, although experts agree that jobs will be created by these technologies, they disagree considerably on how many. This important discrepancy is likely the biggest x-factor in determining the ultimate impact that these technologies will have in the coming years, especially on the workforce. Is your job going the way of the robots? The Future of Jobs Report estimates the changes robotics will bring to the workplace over the next few years. Are you ready to hand your job over to R2D2? A recent study by the Mckinsey Global Institute forecasts up to 800 million workers worldwide could lose their jobs to automation by 2030. Industrial machine operators, administrators, and service workers will be the first to take a hit. Meanwhile, poorer countries with lower investment in tech are less likely to feel the pinch. Today’s chart uses data from the Future of Jobs Report 2018 by the World Economic Forum to take a peek at the changes technology will bring over the next four years. It shows while humans are handing over a larger share of labor hours to their robot counterparts, the future isn’t all bleak. Although 75 million jobs could be displaced by the coming shift in labor, there will be 133 million new jobs created as well. While certain jobs are becoming redundant, human skills remain in demand in other areas. Source: Future of Jobs Survey 2018, World Economic Forum. Roles marked with * appear across multiple columns. This reflects the fact that they might be seeing stable or declining demand across one industry, but be in demand in another. While this coming wave of automation is bound impact the workplace, for now you might want to leave that torch and pitchfork at home – the robots aren’t out to steal your job just yet. Oxford University researchers predict 47% of American jobs are likely to face automation over the next 20 years. However, the same study reveals 53% of jobs are unlikely to be affected at all. Robots are less likely to take over roles dependent on human interaction – like doctors and teachers. Workers in specialized roles, such as plumbing and care work, can breathe easy too. Jobs in manufacturing, transport, and administration may decrease. But a potential rise in health, science, tech, and hospitality jobs is likely to offset this trend. So the real question is, will robots replace your job, or make room for you to pursue a new career?